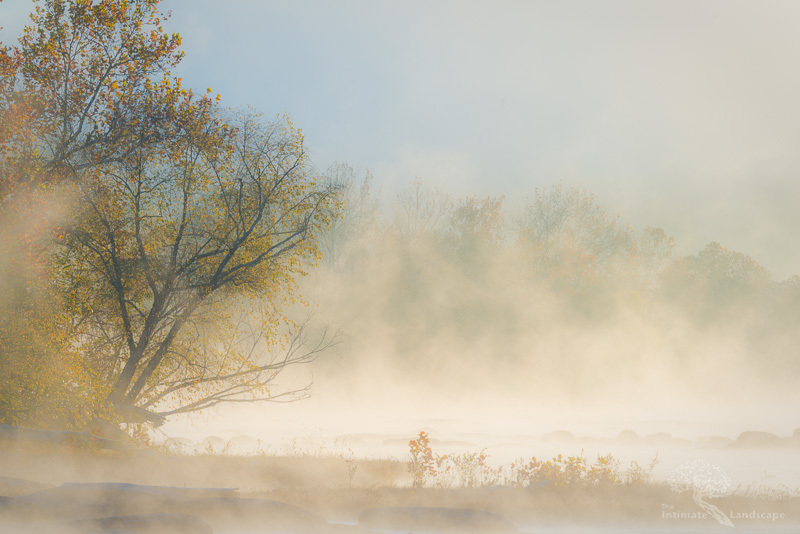 The rising sun illuminates the mist drifting over the James River in this late autumn image. When early-morning air temperature differs just enough from the water temperature in a pond, lake or river, you get a rising mist. Couple that with a sunrise and some late-fall color and you have the recipe for a wonderful image. I like the varying light and density of the mist throughout this image. The low-angle sunrise is coloring the mist and the remaining foliage on the trees and the plants in the foreground. The mist has risen high on the right side of the image, yet breaks enough to display some blue sky over the tree to the left. You get the feeling that the mist won’t be around much longer, as the air warms up and reaches an equilibrium with the water. This image was taken with a Nikon D800 camera using a Nikkor 80-400mm zoom lens at 270mm. The exposure was 1/40th sec @ f/16, ISO 100. This entry was posted in James River, Landscape Photography.